Like I mentioned earlier, this was our first building project ever, so I can say with complete honesty that this is a great project for beginners who want to try building something for the first time. This project took us several weeks, but only because we broke it up over many weeknights. It took us about 7 hours to build it and then it took me 5 additional hours to do all the sanding and staining. This was my first time sanding or staining anything, so for people who are more familiar with both of these this time could definitely be reduced. Cut List: I had all my cuts done at Lowes. For $0.25 per cut, it was much easier to just get it done there. To begin, within this project there are A LOT of kreg jig holes that have to be drilled, so I just wanted to show you our little set up of how we drilled them. We did all of this in the unfinished part of our basement, since it's winter out, and we used a clamp to secure the kreg jig to both the wood and our make shift work bench so that the wood wouldn't move while drilling. Paul still helped hold down the wood as I drilled every single Kreg Jig hole. I had never used a drill before so after I was done drilling every hole I was feeling like Wonder Woman/ Ms. Independent. We started by assembling the bottom of the coffee table by joining the (7) 1 x 6 @ 38.5" pieces of wood with 3/4" pocket holes and 1 1/4" pocket holes screws. We also helped join the wood together with wood glue, and to apply only a thin layer of glue I used a flux brush to help spread it evenly. We made 5 Kreg Jig holes per plank. To help make sure that everything was aligned right, we used both a square and spare pieces of wood on the sides to make sure everything was straight. Now use the (2) 2 x 4 @ 38.5" and the (2) 2 x 4 @ 31.5" to create the square base on the bottom. Secure the 2 x 4's using 2" wood nails. Now to the semi tricky part: centering the beautiful posts to the blocks. How we did this was by securing the bottom side of the post to a block by using the flux brush and wood glue. Once we both agreed that the post was centered, we then put a kettle bell on top and let it dry overnight (Yes, I only use a 10 Ib. kettle bell when working out and yes I know that means I'm pretty weak. ). Once the glue had dried over night, we flipped it over and secured the block to the post using a 2" wood screw. In order to secure the other side of the block, I used Ana White's trick of using clamps and spare pieces of wood to make sure everything was aligned. Once the glue had semi dried we released the clamp and put a weight on top to keep things for sliding around. Once the glue dries, use a 2 inch wood screw to secure the block to the post. Now, you should have 4 fine looking legs that are all done! Set the legs in 1" from the sides and ends and use wood glue to set the legs in place. We then put weights on top to keep things from moving. Before securing the legs to the table with glue, we also used the (4) 2 x 4 @ 25.5" aprons for guidance to make sure that the aprons would fit. 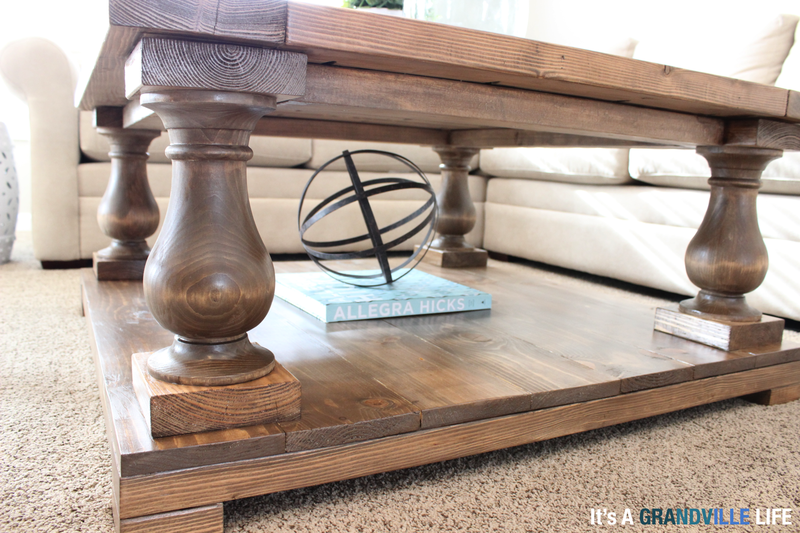 Once the glue is dry, flip the table over to secure the legs to the bottom of the coffee table using 2" wood screws. 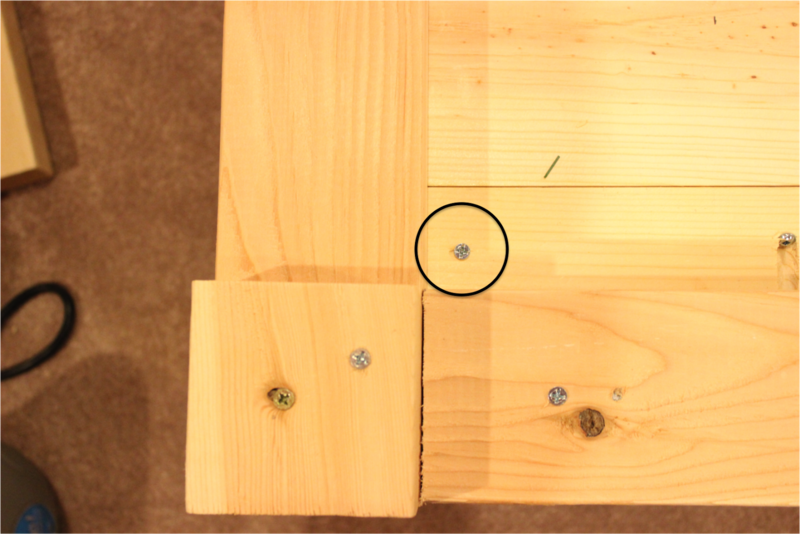 The circled nail is where we inserted the 2" wood screw to secure the leg to the bottom of the table. Now attach the (4) 2 x 4 @ 25.5" aprons to the top part of the legs. Attach the aprons to the inside corners by using 1 1/2" pocket holes and 2 1/2" pocket hole screws on the top part of the board. We also used clamps and a level to help make sure everything was leveled. Here is a better image of what the pocket holes look like on the aprons. Attach the top of the table to the aprons by using 2" wood screws and drilling the screws from underneath into the aprons and upwards. Now do a happy jig because the table is completely built!! Now to the very tedious part of the whole project which is the sanding and staining aspect. I did this entire part of the project by myself, and boy was it frustrating at times (only because this was my first time ever sanding or staining)! At least it gave me a lot of great practice for future projects. First, I sanded the entire top and bottom using my Ryobi random orbital sander. I first sanded it down using the 120 grit sand paper. In order to make sure that I was sanding everything evenly, I drew light pencil marks over the entire top and bottom so that I knew I was removing the same amount of wood all over ( I wish I could say I came up with this genius trick myself, but of course like everything else I found it on Youtube). Make sure to continue moving the random orbital sander so that it doesn't create any uneven holes. After I used the 120 grit sanding disc I went back with a 150 grit sanding disc, then 180 grit sanding disc and finished with the 220 grit sanding disc. The 220 grit sanding disc is what really gives the table that smooth and almost buttery type feeling to it! 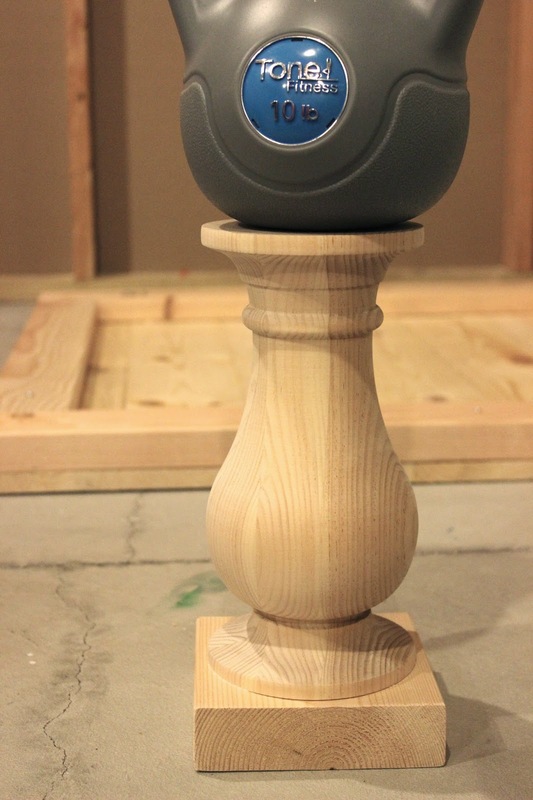 Since I couldn't use the orbital sander on the sides, I used 180 grit and 220 grit sanding blocks. Once it was all sanded, I wiped it down and removed all of the sanding debris. Now to the staining portion! This is the part where you could make the table look a hundred different ways. If you follow me on Instagram, you might have seen the post where I started staining it and then decided that I hated the color I was using which was the Minwax Water Based Stain in American Walnut. Luckily I had only stained the bottom of the table at that point, so it was fine to use a different color stain on the remaining portion of the table. Also, I suggest that you test the stain on a spare piece of wood before staining the table. Although I followed my own advice on this, I still ended up not liking the color of the stain once it was on the entire bottom side of the table. I tried doing some gray wash on spare pieces of wood and although I did like the look of it, it wasn't the look I was going for in our family room. 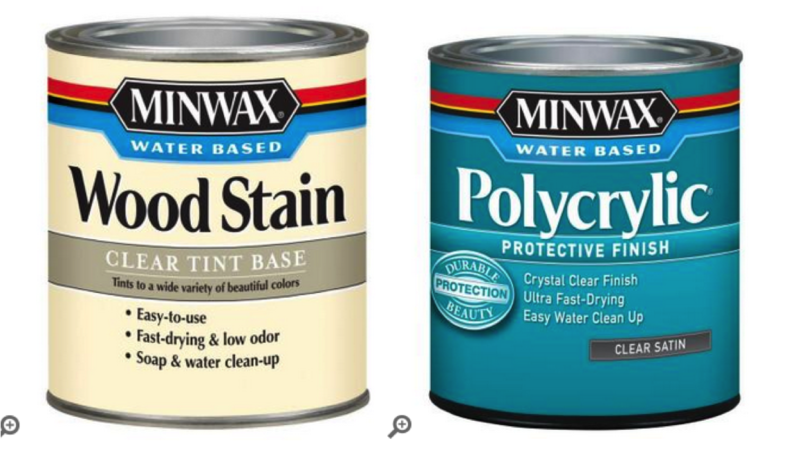 Since it's winter out and my husband doesn't want me using oil based stains in our house this time of year because the VOC in the stain and the little ventilation in our basement, I decided to just use the Minwax water based stain that I already purchased. Since its water based I was able to dilute the stain with water. I ended up using approximately 1 part water to 1 part stain. Then I wiped on the stain and immediately wiped off the stain, working in smaller areas at a time and ultimately feeling like Daniel Son from Karate Kid. Many people recommend that you use wood conditioner prior to staining, but when I tried doing that it seemed like the wood was having trouble absorbing the stain, so I decided to skip this step. After I was done staining, I then applied 3 coats of the Minwax water based polycrylic. The trick with this product is to apply it with a nice synthetic brush and keep your paint strokes slow and few. Do not apply this product like you would paint or else you will end up bubbles. Between each coat I sanded it very gently with a 330 grit sanding block. 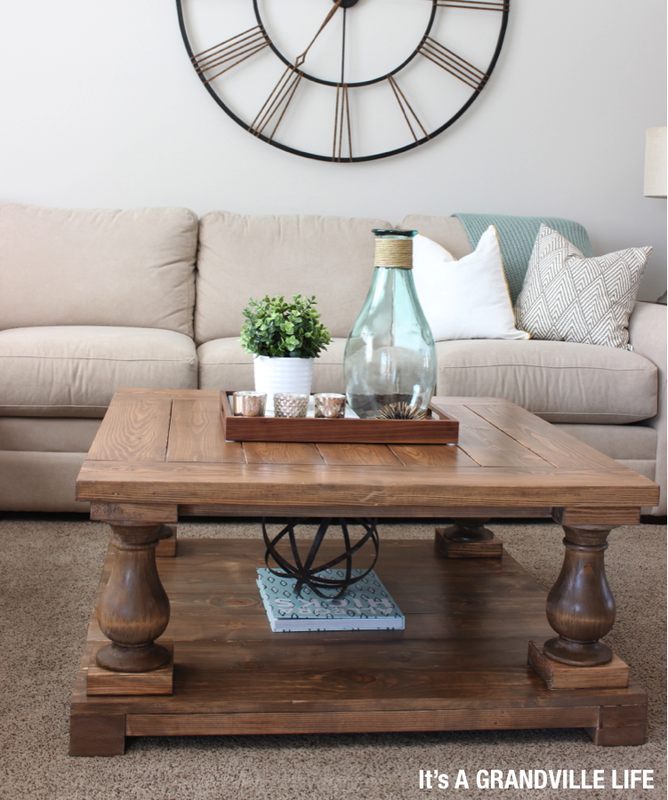 And voila here is the coffee table finished and up in our family room! 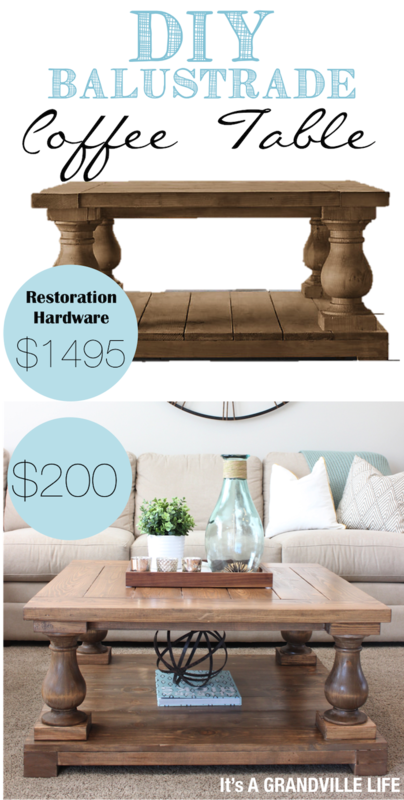 So what do you think, does it look close enough to the Restoration Hardware Balustrade coffee table? If I missed any details on the building process of if you have any questions at all please leave your questions in the comment section below and I will try to respond to them as soon as possible. Also, if you're interested in building this please feel free to pin and share it! I'd love to see your own version of this table! Also, here is the link to Ana White's coffee table design! She also has many other great DIY furniture builds. Make sure to check her out!. Megan, this looks fabulous!!! It turned out so awesome and I love that you worked on it together! This is definitely a special piece you guys will cherish forever and it doesn't hurt that its absolutely gorgeous!! Thank you so much Courtney! My husband and I already joke about one day when we are much older we can tell our grandkids about the time we were young and built the table hah! Just Gorgeous! Great first build, "Brag Post of the Day" on our Facebook page! I love your coffee table! Thank you so much Jeannie!! I was actually very pleasantly surprised at how nicely the legs were packaged when i received them. The shipping didn't take too long, I'd say a week or less, and when they arrived they were individually wrapped, and the box was full of packaging materials so that they couldn't move around in the box. Hope this helps! I love this table. I would want to build a 60 x 60 inch square. Does anyone have plans for that? This is beautiful! Can you please tell me what color you had the paint counter mix your Minwax Stain to? Thanks for sharing your awesome build! Your picture tutorial is insanely helpful, Thank you SO MUCH (mountain top again). I have perused your blog and I think you are amazing. Hi Megan. This coffe table looks awesome. What wood did you use, both for the legs and the table? Thank you. Did you trim the edges from each side of the wood to make it straighter?? I don't understand where in the process all those kreg jig holes become necessary? I don't work with wood at all so maybe I'm missing something obvious but...why? 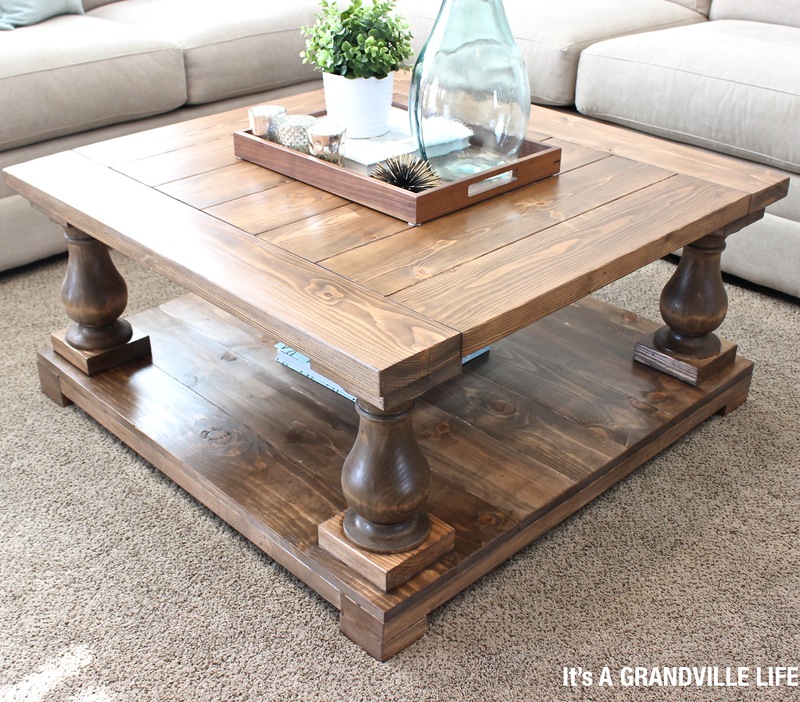 The most beautiful DIY coffee table I have ever seen!! The color is gorgeous! What was the stain color you used? This's absolutely an excellent diy project. LOVE YOUR TABLE!!! You did a fantastic job�� A small little FYI about that wood conditioner: some woods, like pine, have a hard time absorbing stain evenly. Many times pine pieces tend to look “blotchy” without the conditioner, so don’t rule it out totally. Lol! Your table turned out beautifully though!!! Hello Megan, Loved your Coffee table. Ordered the legs! I always wanted a 42 inch by 42 inch but, thought u have good measurement list so planning to go with yours.
" Now we built the top of the table using the (7) 2 x 6 @ 27.5" and (2) 2 x 6 @38.5". " 7*6 = 42 " but how is a 38.5" acted as end without any difference of 4.5"? What type of wood did you use for the pillars and planks?